You know, I think I still have a DVD set of old Popeye cartoons I haven’t watched, and I haven’t gotten my hands on a copy of the last collection of Elzie Segar’s strips either. But I did think of Popeye recently when coming across a label in a store that referred to kale as a “superfood,” a largely meaningless term used for marketing. At least some of the foods marketed that way really are high in nutrients, but they’re in no way supernatural. But that got me thinking how, in Popeye’s world, spinach is literally a superfood. We all know how the typical Popeye cartoon works: he’s getting the crap beaten out of him by Bluto or another rival, so he downs a can of spinach and gains a quick burst to strength that he uses to turn the tables. It’s no wonder Shigeru Miyamoto originally wanted the game that became Donkey Kong to feature Popeye, as the spinach worked pretty much exactly like Pac-Man’s power pills; and indeed that’s how it did work in the later Popeye arcade game. In DK, the hammer has a similar effect, although Mario can’t climb ladders while using it. 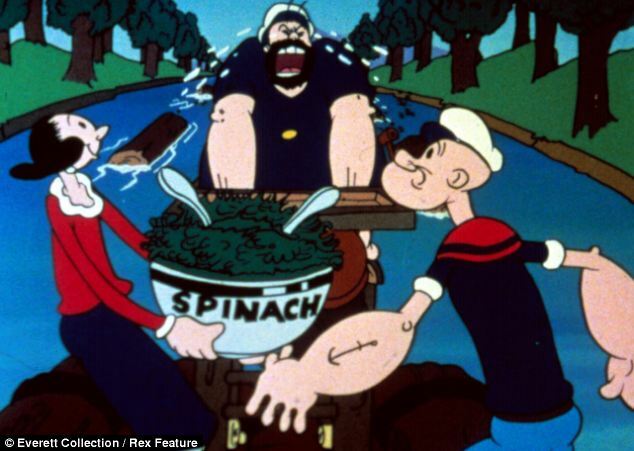 In the original Fleischer cartoons, spinach seemed to work the same way for everybody, even Bluto, the reason he didn’t use it more often presumably just being that he didn’t like it. In one short, Popeye force-feeds Bluto spinach and the big guy has no choice but to beat the tar out of Popeye; he wants to get injured to spend time with Olive Oyl, who’s a nurse in this one. So maybe Bluto avoids it because its effect on him is TOO extreme. I don’t think the fact that he can hold his own against the incredibly strong Popeye otherwise is ever explained. When the character was introduced in the comic, Popeye DID say Bluto was the one guy who could potentially beat him. Spinach also can give Popeye powers other than just strength, like making him a good musician, dancer, or sculptor. So why spinach? It comes from the Segar comics, but there it isn’t a secret weapon so much as just a favorite food. He does eat large quantities of it when he needs extra strength, but it isn’t automatic like in the cartoons. It also didn’t become an element of the strip until Popeye had already been around for a while. In the first story arc, he’s able to avoid being killed by rubbing a Whiffle Hen for luck; but his amazing strength remains in later stories that don’t involve Bernice. Not only can he beat any opponent in a contest of physical force, but even bullets barely harm him. It basically just seems to be part of his characterization as a tough brawler, and might well have come over time as he might have lost an eye in an earlier fight. At least, that’s what’s originally implied, but when we later find out his father is missing the same eye, it might have been retconned to a genetic abnormality. In the cartoons, even Popeye’s young nephews have the missing eyes. Eventually, Segar did reveal spinach to be the secret to his hero’s strength, or at least ONE of the secrets; he also drank a lot of milk (good thing he wasn’t lactose intolerant). He also mentions that he grew up behind a vegetable market, which is how he got hooked on spinach in the first place. Apparently smoking didn’t have any ill effects on his health either. Actually, I seem to recall Popeye cartoons from the 1950s and later rarely showing him SMOKING his pipe, but rather using it as a sort of all-purpose tool. I don’t know if this had to do with increased knowledge that smoking was unhealthy or not. A quick search on the Internet will reveal several articles about how the emphasis on spinach over other green, leafy vegetables was due to a typo. In the 1870s, German chemist Erich von Wolf misplaced a decimal point in transcribing how much iron was in a hundred-gram serving of spinach, from 3.5 to the ridiculously high thirty-five. Incidentally, by this time, “spinach” was already a British term for nonsense. But even if the chemist’s mistake were still a thing fifty years later when Segar made spinach the sailor’s favorite snack, I’m sure he realized that eating a lot of spinach wouldn’t give anyone the ability to beat up a gorilla. In one comic, Popeye states that the reason he eats a lot of spinach isn’t for the iron, but for the Vitamin A.
It’s healthy for anybody, but for some reason it has a particularly amazing effect on Popeye. But I don’t think anyone held up comics and cartoons as an accurate portrayal of the power of vegetables; they were, after all, primarily supposed to be funny. The later superhero trend in comics tended to steer their origins for supernatural powers towards things a normal kid couldn’t imitate, like Superman being an alien. Okay, I guess kids COULD have exposed themselves to radiation like the Fantastic Four or the Hulk, but even there it was usually suggested that these were the results of atypical situations. Others went back to mythology to have the powers of ancient gods, certainly not a new idea. Hercules was super-strong because he was the son of Zeus, Achilles was bathed in the River Styx by his immortal mother, and even Samson had not just the long hair but exposure to the spirit of Yahweh. Come to think of it, there was a Famous Studios cartoon set in ancient Greece where Popeye asks a boon of the goddess of spinach. Interestingly, Bluto was Hercules in that one, while another from the same era made Popeye Hercules. And when Captain Strong, a Popeye knockoff, appeared in Superman comics, it was stated that the vegetable he used to gain strength was of alien origin and highly addictive. This entry was posted in Advertising, Cartoons, Comics, Conspiracy Theories, Donkey Kong, Families, Food, Greek Mythology, Health, Humor, Mythology, Pac-Man, Popeye, Video Games and tagged achilles, bluto, captain strong, elzie segar, erich von wolf, famous studios, fantastic four, fleischer studios, hercules, olive oyl, poopdeck pappy, samson, shigeru miyamoto, spinach, superfoods, superheroes, superman, the incredible hulk, vegetables, whiffle hen, zeus. Bookmark the permalink.